The flavors of Southeast Asia come alive with the Thai Sweet Chili Menu Flavors. A touch of ginger and a sweet chili sauce take meals like Crunchy Thai Noodle Salad to the next level. 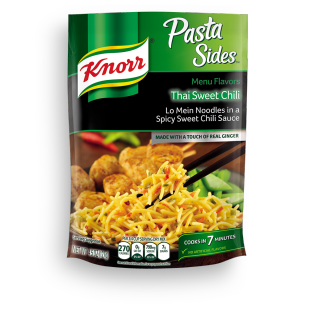 Thai Sweet Chili Noodles is rated 4.6 out of 5 by 14. Rated 5 out of 5 by Nikkay from Pregnant with cravings!!! This product is amazing, I am pregnant and I've been CRAVING this, but I can't find it in stores anywhere! I've tried to make it homemade, but it never tastes the same :( also it won't let me order any online :( I would order a huge case of this if it would let me! Rated 5 out of 5 by sabrina from yummy, but no longer available :( Yummy, wish they would restock this in all my local stores. I have been to 6 different grocery stores looking for this and no one carries it any more. I wonder what happened??? Rated 5 out of 5 by kellie from The best one This is the only flavor of pasta sides I liked. I can't find it anywhere. Please, please bring this flavor back to local southeast Michigan stores. Thank you. Rated 5 out of 5 by Kat418 from WHY can't I find this anymore? My family love, love, loves this! Why can't I find it any more? I'd even buy it online but it's not available to buy on line.